How to select transport documents correctly? Transport documents should be selected in accordance with the applied mode of transport. Air transport documents should be used in shipments made by air, sea transport documents should be used in shipments made by sea, road transport documents should be used in shipments made by land, rail transport documents should be used in shipments made by rail and multimodal transport documents should be used in situations where more than one mode of transport is used under single transport document. 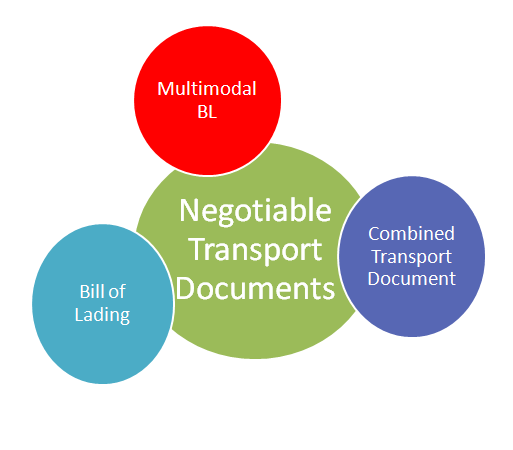 Negotiable transport documents are document of title. They provide their holders right to demand delivery of cargo from the carrier at the port of discharge by surrendering at least one original copy. Negotiable documents should be issued made out "to order", or “to the order of a named party”, or “to the bearer”. Otherwise they may be accepted as a non-negotiable transport documents by law. Which documents should be issued in a negotiable form? Non negotiable transport documents should be issued made out “to a named consignee”. Which documents should be issued in a non-negotiable form? Non-Negotiable Bill of Lading => Sea Waybill, Express Bill of Lading etc. 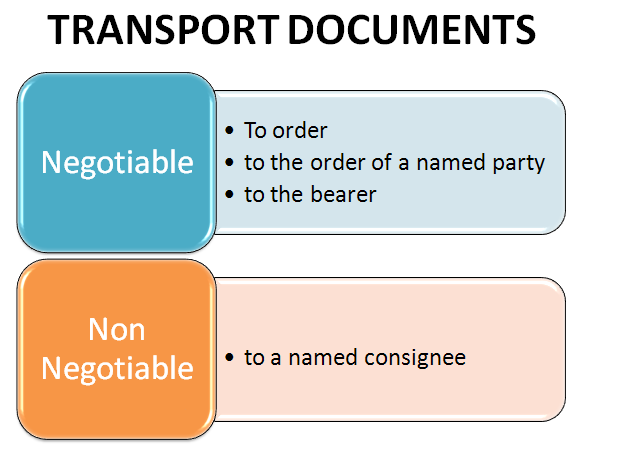 As explained above only negotiable transport documents can be issued "to order", or “to the order of a named party”, or “to the bearer”. These documents are bill of lading, multimodal bill of lading and combined transport document. Other transport documents such as non-negotiable bill of lading, sea waybill, express bill of lading, air transport documents, (air waybills), road transport documents, (CMR), rail transport documents, (CIM) can not be issued "to order". They should be issued made out “to a named consignee”.